This training plan is designed for the novice/intermediate runner looking to race a 5 Mile Road Race. This plan assumes the athlete can handle 25 miles of running in a given week relatively easily and can run 5 out of 7 days. The athlete may have recently completed some base aerobic training OR just raced an 'A' race and is now looking to do a late season running race. Prior to beginning the training plan, the athlete should be training consistently and should be able to comfortably run an hour at an aerobic/Z2 pace. ** Purpose ** Train your Aerobic Endurance pace to work on endurance, fuel economy and resistance to injury. ** Main Set ** Run in Z2 for the distance specified. 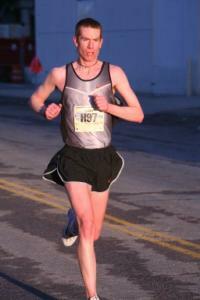 Train your Aerobic Endurance pace to work on endurance, fuel economy and resistance to injury. The strides allow you to work on form (running economy). Run in Z2 for the distance specified. A stride is approx 30 seconds at 95 percent effort (Zone 5c). Ease into the effort, hold the pace and then gradually slow down. Focus on relaxation of the face and fingers while running with a proud posture and quick cadence. If desired (or instructed to work on turnover) count your right-foot strikes for 30 seconds. Aim for approx 45 right-foot strikes.